What’s the one thing you don’t have to force yourself to check every day? Email. Everyone checks their email. It’s not something you have to go to, it’s there. One of the problems with a lot of ‘apps’, is that you have to launch them and interact with them to make it something of a habit. Certainly, integration with the OS, cloud, and social networks is helping them be more part of our workflow, but they’re still a step away. I remember we talked about Momento a while ago, and while it was and still is a beautiful app, journaling is still a chore you forget about. OhLife is different. OhLife practically has no user interface. It’s email. 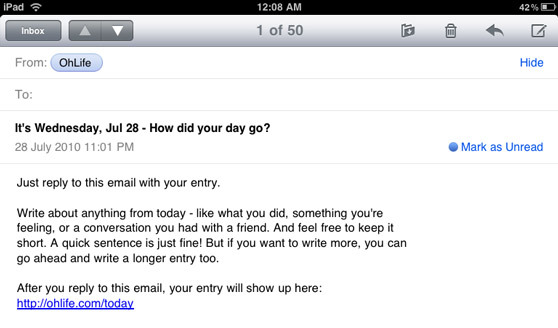 Every evening, at 8 p.m., you get an email asking you what your day was like. Reply, and send. You don’t have to go to remind yourself to write, nor is it like a notification, where you still have to leave what you’re doing to write your note. It’s email. OhLife takes it a step ahead. Once your diary is filling up, OhLife will randomly select past entries and pastes them in along with your reminder. After all, what’s a diary if you don’t get back and reminisce over life’s moments. You can of course view a full list of your past entries, all laid out in beautiful CSS, and even edit them online if you feel the need to (though you can add stuff to your entry just by replying again). Also, if the services one day decides to shut down, you still have your entries in your sent mail folder (though I do hope there’s an XML export feature somewhere down the line). OhLife is free (as of right now), and is definitely worth your time. I’ll probably change my style of journaling to writing in second person.